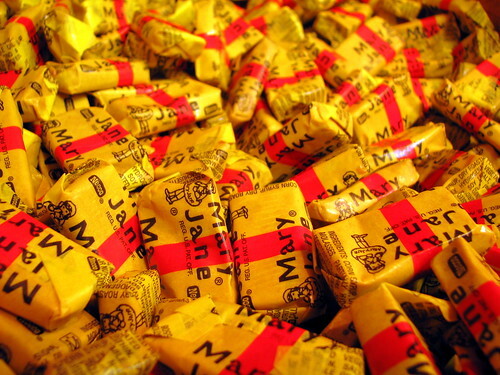 When I was a kid, Mary Janes were my least favorite candies I'd pick up on Halloween. But I didn't like Skittles, gum or grape lollipops either, so I guess I was really fickle with candy. Bits of the wrapper, would frustratingly always stick to the candy. It was a super hard and tough to chew taffy that was peanut butter flavored. That, and some point, I learned that Mary Jane was another name for Marijuana(not knowing it was a kind of shoe), and that has to make it bad, right? Today, I think they at least look cool, with somewhat of an old design. I found this at one of the many Candy Shops in Pigeon Forge. 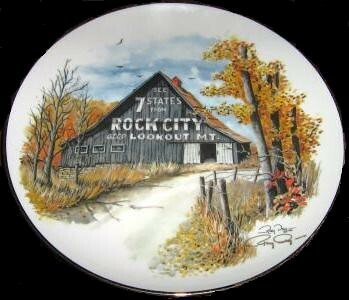 SEE 7 STATES FrOM ROCK CITY atop LOOKOUT MT. Oddly, the r in FrOM is not capitalized. Located on Highway U.S. 31E in Hart Co. Ky.
A couple of years ago, I was visiting Huntsville's new upscale mall, the Bridge Street Town Center and a Halloween Costume contest was going on. 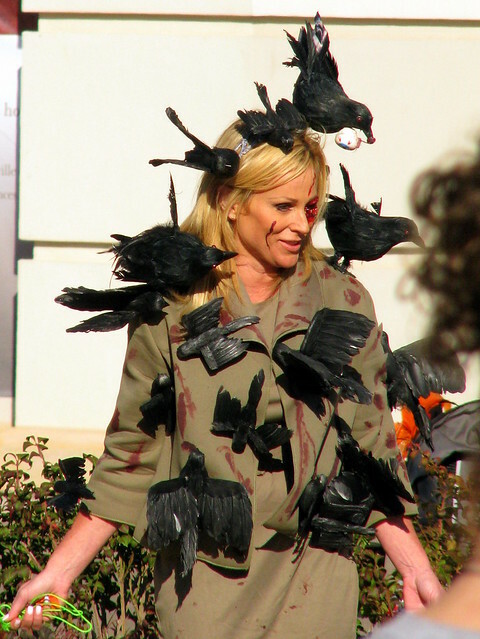 This lady gets an A+ for her Tippi Hedren look from Alfred Hitchcock's The Birds. The clamshell was a popular date spot in Centennial park for years. Apparently, it had been deemed unsafe a long time ago, and has been fenced in for as long as I can remember. 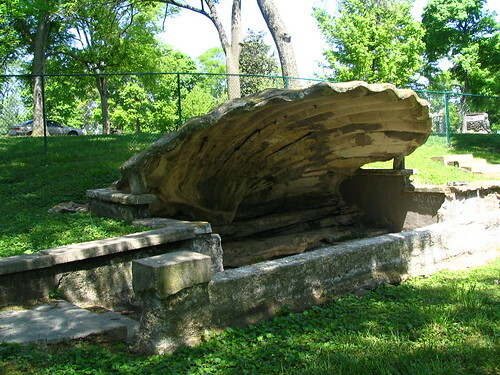 The clamshell goes back to the time when Centennial Park was Nashville's first city park. Oddly, there is no record of who paid for the clamshell to be set up. The earliest Metro Parks department ran on a very tight budget and did not have had money for this. One guess is that it was funded by Major Lewis, who made his money with the NCStL railway and was an early member of the Parks board. Since this civil war battle was fought over positioning for a major rail lines, in the early 20th century the NCStL Railway listed the battlefield as a stop and point of interest. 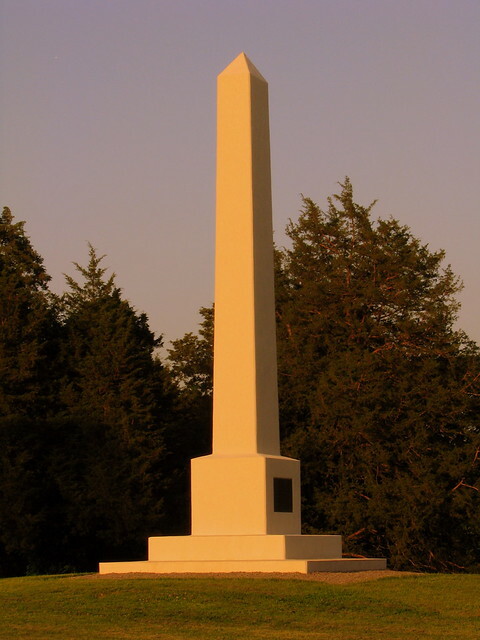 In 1906, the company erected a 31-foot obelisk to commemorate the January 2, 1863, position of massed Union artillery used to repel a Confederate assault on Union troops across the river. 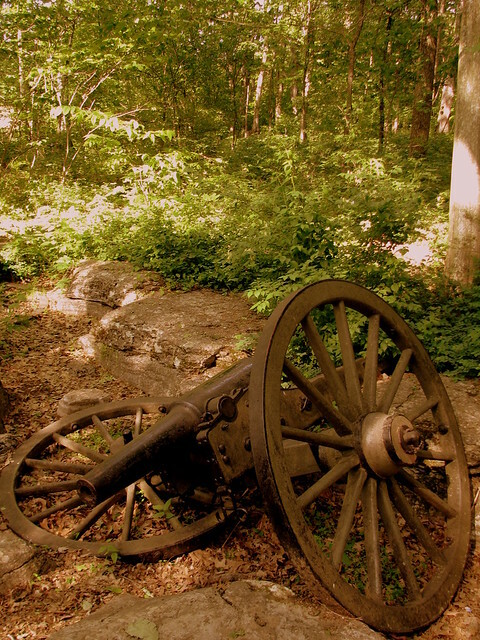 On Janary 2nd, 1863 at 3:00 P.M., there were stationed on the hill fifty-eight cannon, commanding the field across the river, and as the confederates advanced over this field, the shot and shell from these guns, resulted in a loss of eighteen hundred, killed and wounded, in less than an hour. Shops of N.C.&StL.RY. July 1906. Located in Tennessee's oldect City, this building has quite a history. In 1797, the Mitchell family built a home here with wood joists, stone foundation and four fireplaces. In 1851, William Maxwell added a two story addition, a parlor on the ground floor and a large second floor room that held sequestered juries. In 1869, Laura Gosnel bought the house to use it as a boarding house. In 1910, Peter Miller bought the house and added on to make it a hotel. The most prominent addition was the full length second story porch. His additions were so seamless that it made the entire building look like it was all built at once. This was the beginning of the Eureka Hotel. In 1910, JR Russell bought the hotel and added even more, such as running water and the three third floor windows. Now, it was known as Hotel Russell. 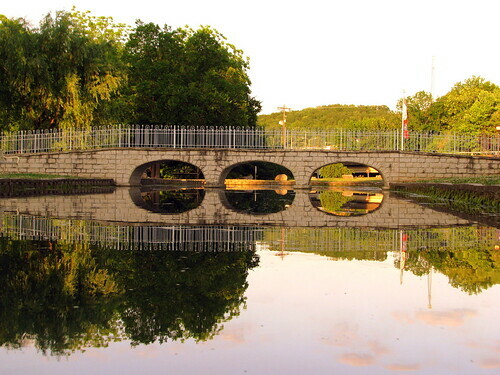 One of the most important spots in the history of Fayetteville, TN was the old Stone Bridge. That bridge was built in 1861 at a length of 450 feet over the Elk River, saved from destruction in the Civil War, but was finally tumbled by flooding in 1969. In 1997, the city established Stone Bridge Memorial Park, and in June, 2000 unveiled this 36 foot replica about 1000 feet from the original. aka the Carlisle house on highway 96 was moved to its hiiltop perch west of Franklin after it was used in the Tennessee Centennial exhibition at Centennial Park in 1897. 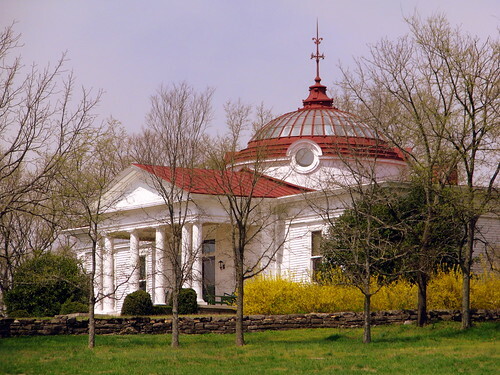 Originally the Knights of Pythias Pavilion, this glassdomed and wooden structure was constructed by the fraternal organization for the Exposition, for which Nashville’s famous Parthenon was also constructed. The building was actually dismantled and moved from the exhibition site in 1900 by Joseph Parks, supposedly to impress a woman he was courting. Perched on its rocky knoll, this National Historic Register property has witnessed over a century of change, and is still a private residence today. 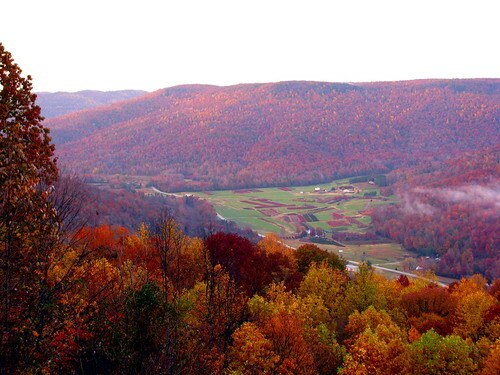 Beersheba Springs used to be a resort town in Tennessee's Cumberland Mountains in Grundy County. 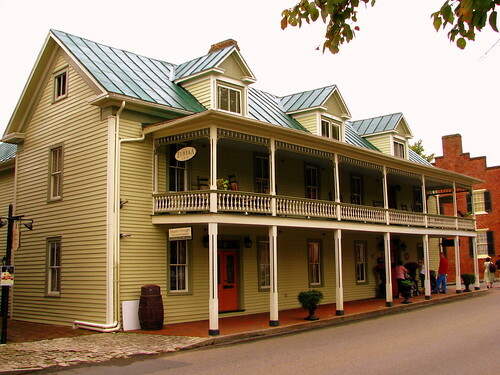 While there, the place to stay used to be the Beersheba Springs Hotel. This is the view from the observation deck from the hotel at dusk. It hasn't been open as a hotel for many decades and is now owned by an organization of the United Methodist Church. The road below is highway TN56 after it has descended from the mountain and it goes to McMinnville. The title of this photo has a double meaning. First of all, this is a deserted, adandoned, crumbly strip of three buildings. It looks like it could fall apart at any moment. 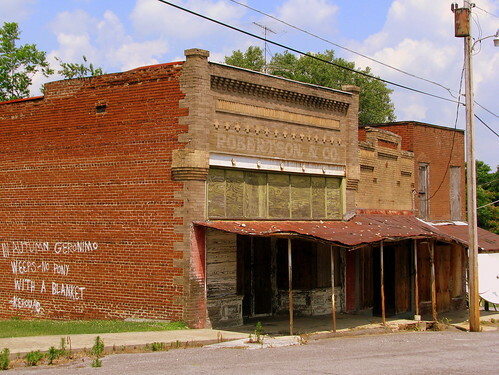 Secondly, it's in the old business district of Adams, TN - the town made famous as the home of the Bell Witch. It makes you wonder what the builders of such a place would have to think if they saw it today. If one more person threw a rock on the awning of the Robertson & Co. building, do you think it would fall in. On the side of the building is the county's most famous graffit. "In Autumn Geronimo Weeps - No Pony With a Blanket" - Kerouac. That's too Beatnick for me. I have no idea what it means. 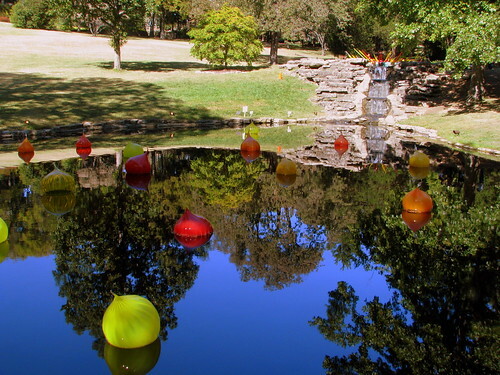 Continuing the theme from yesterday, here are more of Dale Chihuly's art at Cheekwood. These floating glass sculptures are the Walla Wallas. 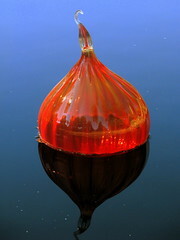 They are beach-ball sized and resemble the shape of an onion. They are afloat in the Robinson Family Water Garden. 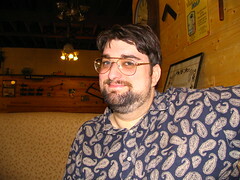 On the left is a closeup of one Walla Walla. On the right is The Boat in the upper lake. This display has been available all summer, but I just saw it recently. Like I mentioned yesterday, if you'd like to see it, you have until the end of October to get out there. 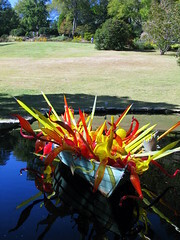 To see all of my Chihuly at Cheekwood photos, Click Here. Now online is the newest SeeMidTn.com Extended Gallery for historical markers, highlighting ones from Rutherford County. Most of the markers are from the Stones River National Battlefield, with a few others from Murfreesboro, Smyrna and other nearby areas. If you like Markers, or are a Civil War buff, Check it out. I made a post yesterday about Cheekwood and didn't mention the most important thing going on at the Botanical Gardens right now, their Chihuly Exhibit. 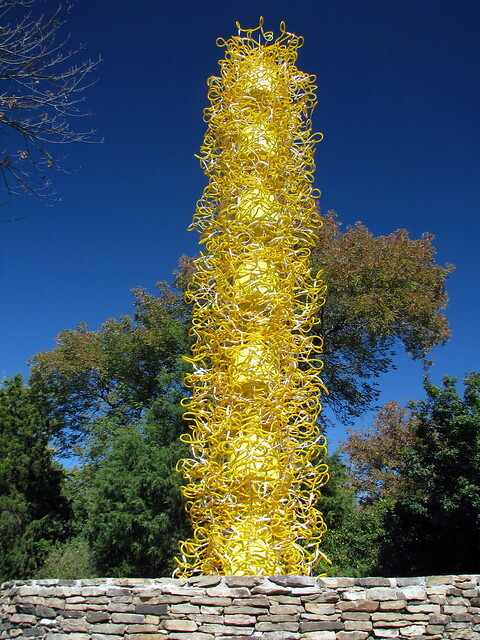 Dale Chihuly is an internationally known glass sculptor. His work has been on display all over the Earth, and for a few months, some of his glass has been set up as a major exhibit at Cheekwood Botanical Garden in Nashville, TN. This display has been available all summer, but I just saw it recently. If you'd like to see it, you have until the end of October to get out there. The Saffron Tower seen above is 27 feet tall and 4,600 pounds. if all the neon tubing were straightened out, it would be over a half mile long. 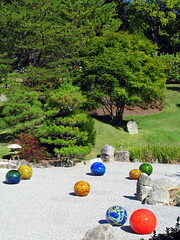 Seen above are the Niijima Floats in the Japanese Zen Garden and The Sun in front of the mansion. At Cheekwood it is part of the Carell Woodland Sculpture Trail, this is the Crawling Lady Hare sculpture. 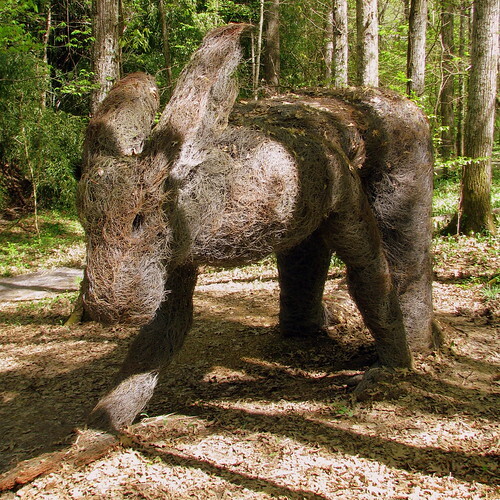 It was made by Sophie Ryder in 1997 and is made of galvanized wire on steel armature. 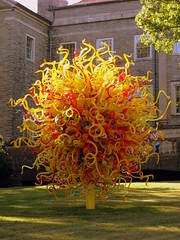 The Chihuly Exhibit is about to run out at Cheekwood. If you want to see it, you better go soon. I saw this butterfly enjoying this tree in Wartrace, TN for quite a while. Does anyone know what kind of tree it is? I can't say I'd ever noticed this type of butterfly when I first saw it. 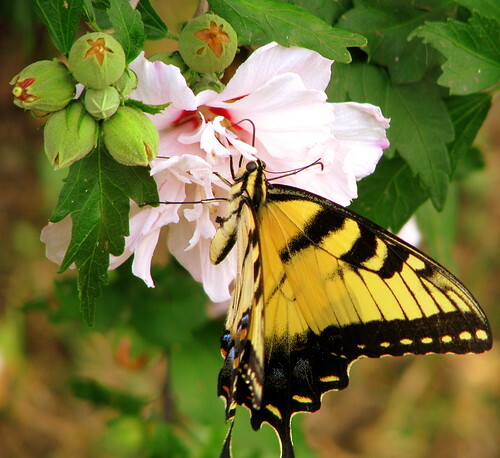 When I think of common butterflies, I think of the Monarch. It's larger and more colorful than a monarch. But, I suppose it's one of those things that you don't notice until you start thinking about it. I've seen a ton of these since this photo was taken. I saw five at at time once a couple of weeks later. This grand example of a covered timber truss bridge is located in north central Sevier County just off of Old State Highway 35 near U.S. 411. 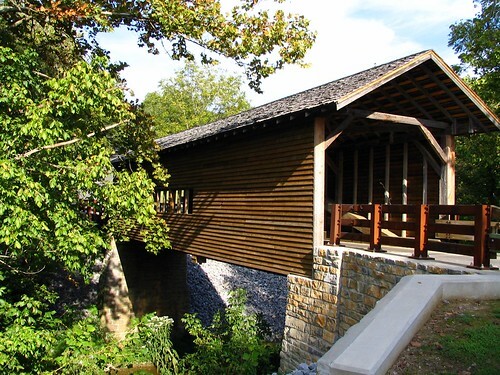 The original bridge was destroyed on February 25, 1875 during a great flood in Sevier County. The Trotter Covered Bridge was also destroyed along with many houses, mills and other bridges. Elbert Stephenson Early who was a resident of Harrisburg rebuilt the Harrisburg Covered Bridge later in 1875. This is the only surviving covered bridge in Sevier County and is still being used for both foot traffic and vehicles. The bridge is 83 feet long and 14 feet wide on the outside with almost 11 1/2 feet clearance inside. In 1969, the bridge was in need of much repair and restoration. The Spencer Clark Chapter of the Daughters of the American Revolution (DAR) stepped in and financed the restoration of the bridge in 1972. The Harrisburg Covered Bridge has been listed in the National Register of Historic Places since 1975. Fall in love with Lawrenceburg - that's the message on the banner on the right. 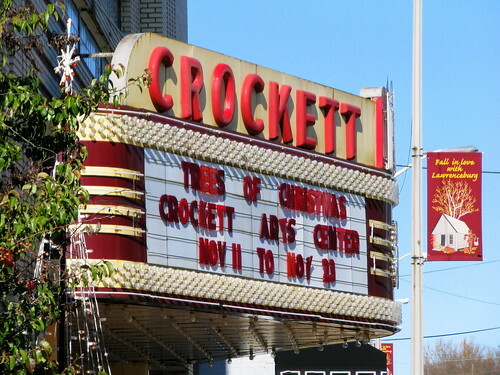 Added to the National Register of Historic Places, and is a fine example of Art Deco in a cinema. 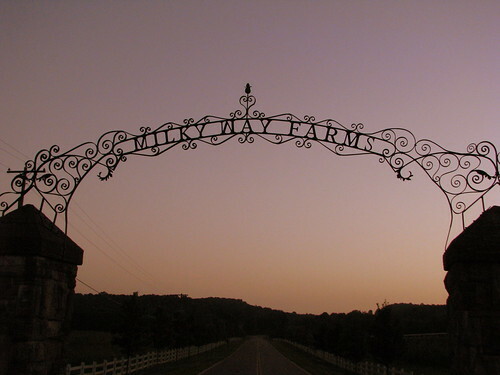 Franklin Mars, the founder of Mars Candies, the company that made the Milky Way candy bar, built a farm here in the early 30's and named it after his famous candy bar. The farm was built along highway US31 north of Pulaski, TN. During the Great Depression, the cattle farm was the largest employer in Giles County and the farm had it's own train station. The farm is on the National Register of Historic Places. At one time not too long ago, the Tudor Revival House was a bed and breakfast. I think there are new owners currently trying to develop the area into a new attraction. For now, I'll just peer in from the entrance. The Cumberland Presbyterian denomination was organized in Dickson County, TN on Feb. 4, 1810 at this location, which was the home of Samuel McAdow. This land was purchased by the Charlotte Presbytery in 1856. A few years later, a small wooden chapel was built here, and a small congregation was established here for a few decades. Then, the state purchased all of the adjoining land in the area to build Montgomery Bell State Park. While the surrounding area was developed, the state allowed for this land to be kept as a Birthplace Shrine in 1953. In 1956, a replica of the McAdow cabin was built. 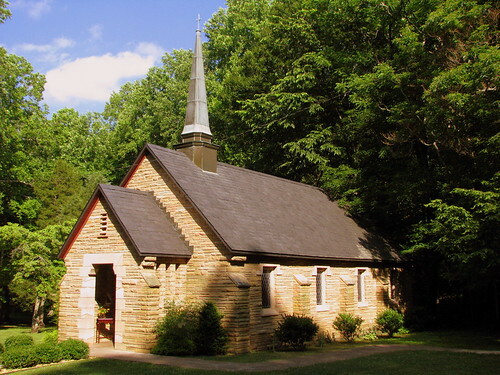 In 1960, to celebrate the sesquicentennial this Birthplace Shrine Chapel was built. These days, when I seek out old train stations, I frequent DepotMaps.com. However, this station isn't on DepotMaps or any of the other depot web resources I use. I had never heard of it until earlier this year. A friend of mine used to live about 5 miles from here, and he told me that 20 years ago, this was completely swallowed by overgrowth. Just recently, The Tennessee Dept. of Tourism has started a new website which will provide auto trails for many of the off-the-beaten-path and hidden gems around the state. This depot is on the first trail to be published, Old Tennessee Settlers to Soldiers Trail as stop #26. 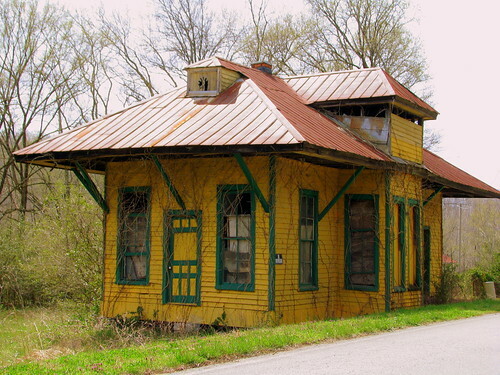 This depot was part of the Middle Tennessee Railroad which operated from 1909-27 along Liepers Creek Valley. One feature I like if you look closely at the top at the front was apparently a clock where the hour markers were carved into the wood. This barn is barely standing up. You may need to enlarge it to see what it fully says. 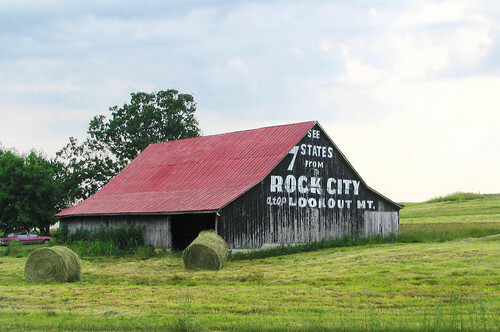 At one time, this was a Rock City barn, and the CK CITY still comes through at the bottom half of this barn. When Sequoyah Cavern opened commercially by Clark Byers (the famous painter of the Rock City barns), this barn was repainted to say Buffalo and White Deer. The big blob on the left is an arrow that points at Sequoyah Cavern. 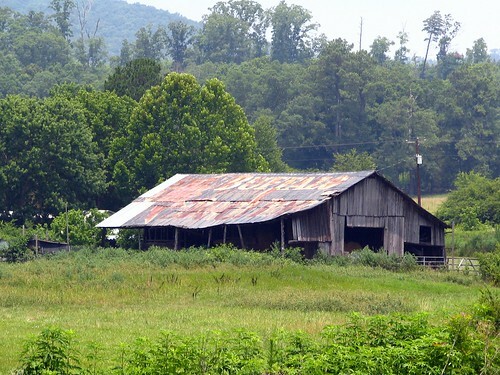 You can see this barn along Interstate 59 in Dekalb County, Alabama, and this barn points you at the street that runs to Sequoyah Cavern, although there is not an interstate exit here. The Sequoyah Caverns people apparently don't have buffalo anymore. 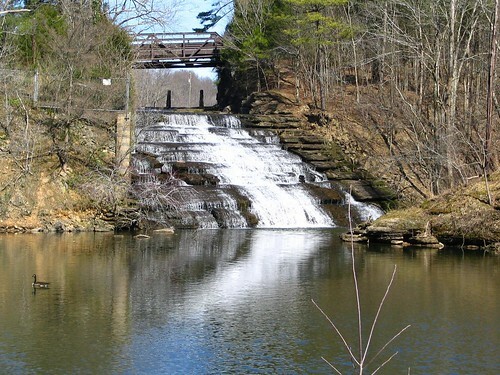 In the 1930s Marrowbone lake was formed when a small dam was built upriver a few feet from this waterfall. This area is maintained by the TN fish and wildlife dept. to the right of this waterfall is a short but steep trail that'll take you to a good fishing spot. This is in Northwest Davidson county, just off the Clarksville Hwy. I think someone somewhere gave it the name "Hidden Waterfall." It seems right out in the open to me. However, this lower lake is mostly on private property and to get this view, you have to look through a chain-link fence. Also known as First Tennessee Plaza. The skyscraper is 327 feet tall. 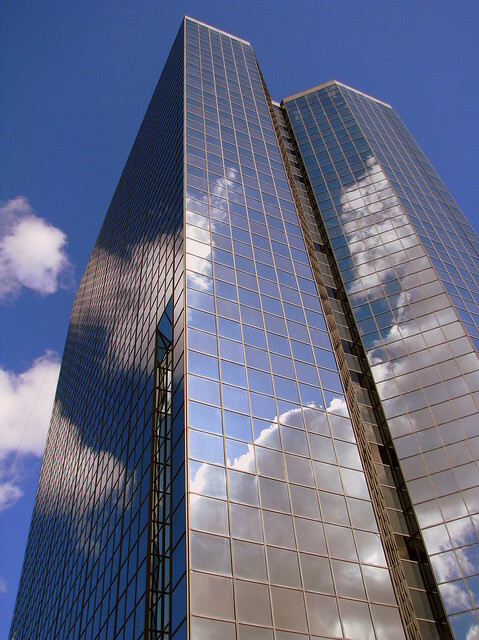 It is 27 floors, with the first 24 floors of businesses, 2 mechanical floors and the top floor is the Leconte club. 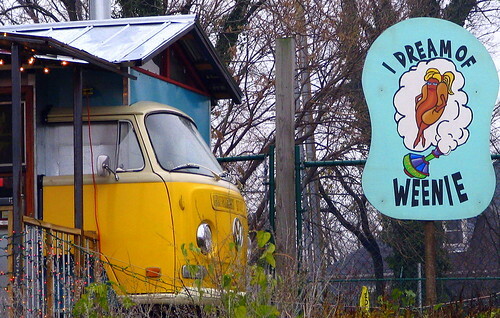 Before you get the wrong idea, this is a hotdog stand in East Nashville. (on Woodland St.) It's in a area slowly becoming trendy, Five Points. Their other sign: East Nashville's only full service weenery. 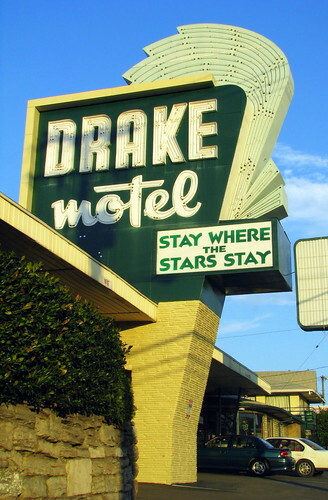 Quite possibly the neatest Motel sign in Nashville. However, it's not in the best neighborhood anymore, on Murfreesboro Rd. Before the days of Interstates, this was in a heavily travelled area by tourists, U.S. 41 and U.S. 70S. 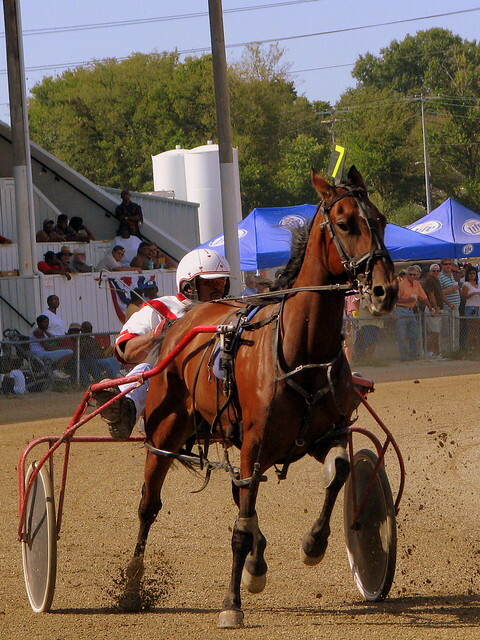 The Lincoln County Fair in Fayetteville, TN is best known as the only place in Tennessee where you can see harness racing, which was discussed yesterday. There are quite a few other things to see like any fair. 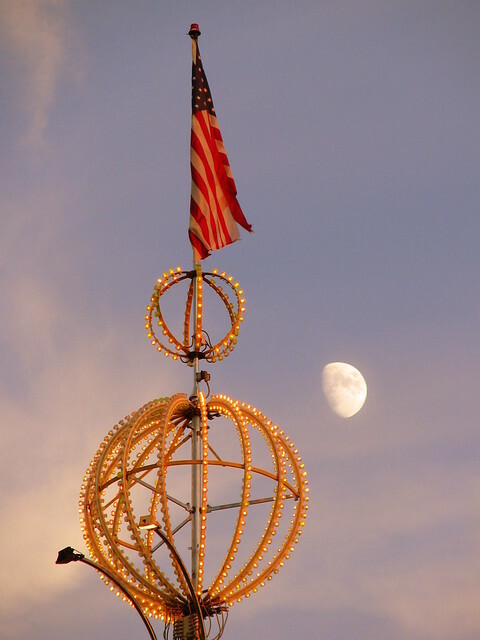 This is the top of the free-fall ride along the midway at dusk. 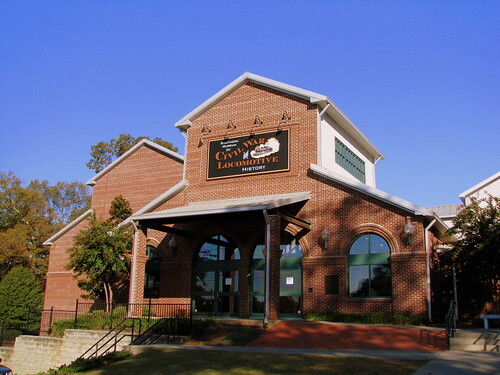 In Kennessaw, GA, this museum's main feature is housing the locomotive "General"
About 6 A.M. on April 12, 1862, a Federal spy and contraband merchant, James J. Andrews, of Ky, together with 18 soldiers and one civilian seized "General" and three box cars while the train crew and passengers were eating breakfast at the Lacy Hotel. Intedning to sabotge the state railroad between Atlanta and Chattanooga, the raiders steamed north to destroy track and burn bridges. They were foiled in this attempt by the persistant pursuit of conducter of the train Capt. W.A. Fuller, Fireman Jeff Cain and Anthony Murphy of the Atlanta Railroad shops, after a chase of 87 miles at the tracks a few feet from this location. 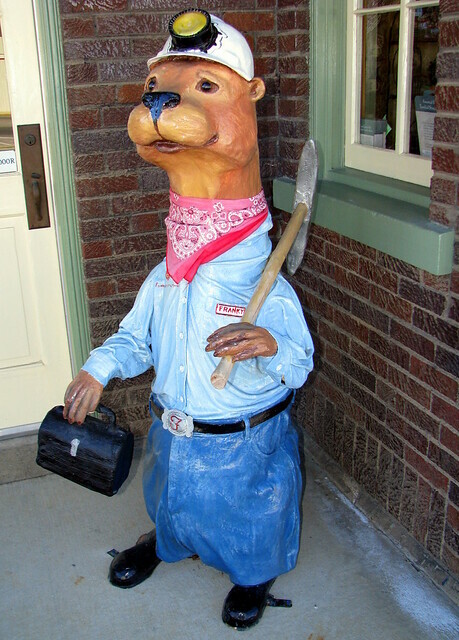 As more and more cities decide upon a town animal mascot that they place statues of all around, Crossville, TN has recently settled on the Otter. I was told by the lady in the gift shop of the Crossville Depot where this is located that Otters, once common, are now near extinct in many parts of Tennessee, but not in Crossville. Coal Miner's Otter seems like such a perfect name, but alas, this is Franky. Franky represents the mining activity of Cumberland County and was donated by Franklin Industrial Materials. In the vein of 'It's not funny if I have to explain it,' the title is a pun based on Middle Tennessee's Coal Miner's Daughter, Loretta Lynn, who now lives in Hurricane Mills. Sadly, I never found a "Welcome Back, Otter"
This is one of two Wiard rifled cannons lost by Lt. Alexander Marshall of Battery G 1st Ohio Light Artillery. These guns valiantly but vainly tried to check the Confederate advance by firing repeated changes of canister then retreating "by prolonge" to fire again. The guns were abandoned when most of the horses were killed and the Confederates were but 40 yards from the guns. In this area 14 union cannons were lost to the Confederates by Sheridan and Negley's Divisions.